I've been sent this by email. I've been on this walk a number of times but Saturdays are in short supply in early Summer. This year the walk clashes with the LMS Committee meeting! But I do encourage everyone who can, to go. where there will be light refreshments. Take part in this peaceful walk to support the pro-life cause, and to advertise the work of Life. Some placards will be provided. Bring children and friends ! As I've noted on the Gregorian Chant Society blog, we had a training day on Saturday with Philip Duffy, who was for 30 years the Director of Music at Liverpool Metropolitan Cathedral. Here is Fr Saward's sermon, on Mary and the Ascension. During the weekend of the 18-20 September 2009. Young Catholic Adults (YCA are part of the international Juventutem Federation) will be running a Traditional Retreat at Douai Abbey in the south of England, the weekend will be led by Juventutem Ecclesiastical Assistant Fr de Malleray. Douai Abbey, situated on high ground in the Berkshire countryside provides an ideal setting for quiet reflection, retreats and for conferences. One of the comments frequently made about Douai is that it offers an environment and atmosphere of peace and serenity, where the cares of daily life can be left behind. Hospitality has been a special concern of monasteries from the earliest times. St Benedict teaches in the Rule "All guests are to be welcomed as Christ". All rooms are fully en-suite offering accommodation for guests in the Bl Hugh Faringdon , St Alban Roe and the St Benet Biscop buildings. For the first time Young Catholic Adults will be using the main Abbey Church for a Missa Cantata, sung by the Douai Singers. The cost of the weekend will be from as little as 25 pounds for students (or 48-88 pounds for non students) for more details, please see http://www.youngcatholicadults.co.uk/news.htm or email juventutemcatholicam@yahoo.co.uk; or ring 07908105787. The Sung Mass (Missa Canta) on Saturday 19th September 09’ at 10am followed by a Marian Procession around the extensive grounds of the Abbey at 11am (starting from the main Abbey Church) are open to the public. There are also a few rooms allocated for all age groups (not just YCA) so please book soon. There are limited places so please reserve your place early! This has been another very busy week. I was invited to the Installation of Archbishop Vincent Nichols in Westminster Cathedral, and so was unable to be with the Schola Abelis for the Ascension in the Oxford Oratory. I hear it went well, but I don't have any photographs! Mass at the Cathedral was of course not the Ascension. When I got back from London I had the choice of going to the Ascension at Reading (sung, at 7.20pm) or St Birinus, Dorchester on Thames (Solemn, 7.30pm). I went to Dorchester - in fact I gave Fr John Saward, who preached, a lift - and so was able to witness a Solemn Mass there for the second time. St Birinus was packed, and the music, provided by Mr Andrew Knowles, was superb. It was mostly Hyden, in recognition of his 200th Anniversary. The Installation was an impressive service. The great cathedral was packed. The Latin Mass Society was allocated one ticket, a first for an event of this kind, and a sign of our growing acceptance as part of the Catholic mainstream. The service ended with the Te Deum, sung antiphonally between the choir - singing a polyphonic setting - and 'all', singing the simple tone of the chant setting. The choir is superb but I have my doubts about this arrangement; I think the congregation would have sung more confidently if the whole thing had been sung with the chant setting, which repeats themes and makes overall musical sense. 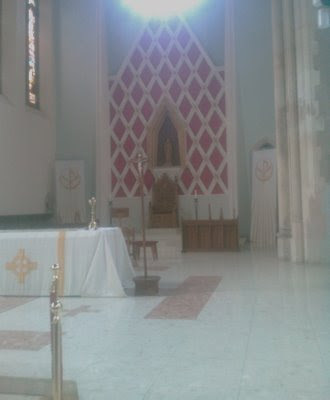 In my part of the church - a side chapel - we were sitting on benches which didn't have kneelers. At the canon I knelt down, but the Catholic great and the good who were with me did not. 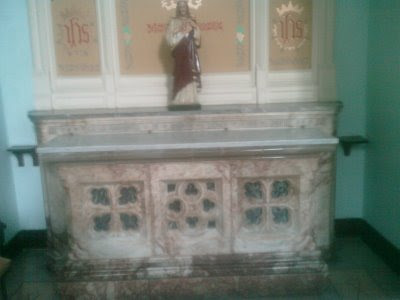 An unwillingness to kneel on a marble floor may be the least of the problems of the Catholic laity in England and Wales, but it is a representive one. If they won't submit to any discomfort for Our Lord, how much support are they going to give Archbishop Nichols when the going gets tough? I've been too busy to post for a few days but Fr Zuhlsdorf's comments on the Notre Dame scandal bear repeating. Fr Z. reiterates his fundamental principle that the Church's problems are not separable from the liturgy. How is it that a great Catholic institution could sink so low, and in the face of the appeals of more than 70 American bishops? It is - to cut a long story short - because its leaders, and too many ordinary Catholics, have lost their sense of the sacred and their Catholic identity. More than ever, we must have what the Church really says, what Holy Church really has to offer. We are not getting the fullness of the Church’s teachings from Notre Dame or other, now lesser, water carriers of the secularist agenda. We are not getting it from very many of our leaders in the Church. If you sense that something quite serious and important is going on right now, for the love of God rethink your approach to how you foster Holy Church’s proper public worship. Do all in your power and through your influence to foster a worship of God which conforms not to worldly goals – as praiseworthy as they may be in a world still dominated by its dire prince – but rather to the real point of religion: an encounter with mystery. Our worship must become more and more focused on the one who is Other. Seek what is truly above in your rites and raise people to encounter mystery. You will be challenged and reviled, blocked and attacked as you do. You will be worn down and afraid under the weight of resistance. 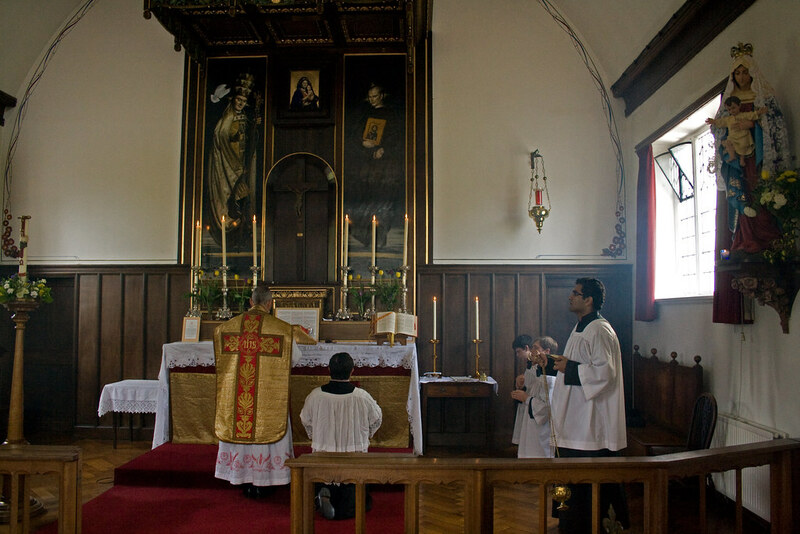 But I think that to save the world we must save the liturgy. Sunday reaffirmed this for me. 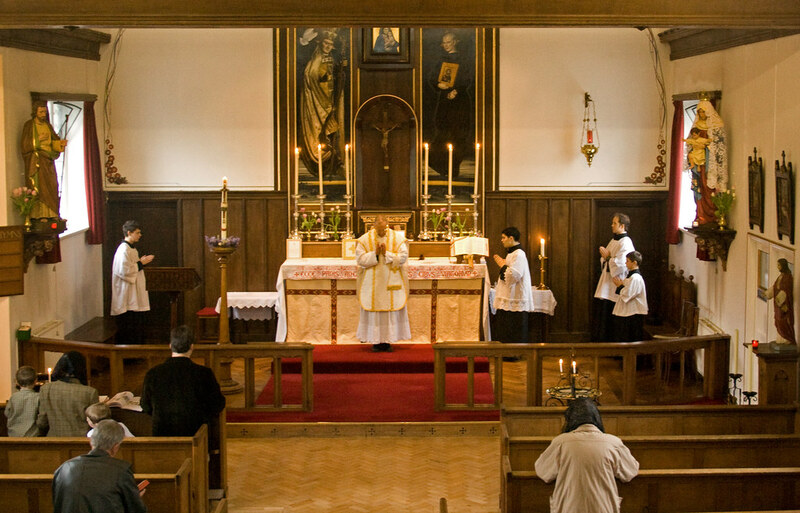 They can’t compete with the fullness of Catholic liturgy and sound preaching.Reforming the liturgy along the lines Pope Benedict has proposed may be the most loving and effective option we have in these ever hotter times. People will have to keep working very much in the sphere of the secular. Of course! Our inward Catholic Christian identity must find outward expression and bring concrete fruits. But I think the real work now – where we will make some effective headway – must be done at the level of our public worship. In the present circumstances, we are not going to argue most people out of danger or error. But together we can draw them in and along and back through worship. So long as we remain doctrinally faithful and active in works of mercy both spiritual and especially temporal, if we get our public worship together we will have a strong bastion against error. Holy Catholic worship will be an attractive force for conversion. We need to foster worship which stuns, which leaves the newcomer, long-time practicing Catholic, above all the fallen-away simply thunder stuck. Worship must at some point leave people speechless in awe. We need language and music and gesture which in its beauty floods the mind with light even while it swells the heart to bursting. 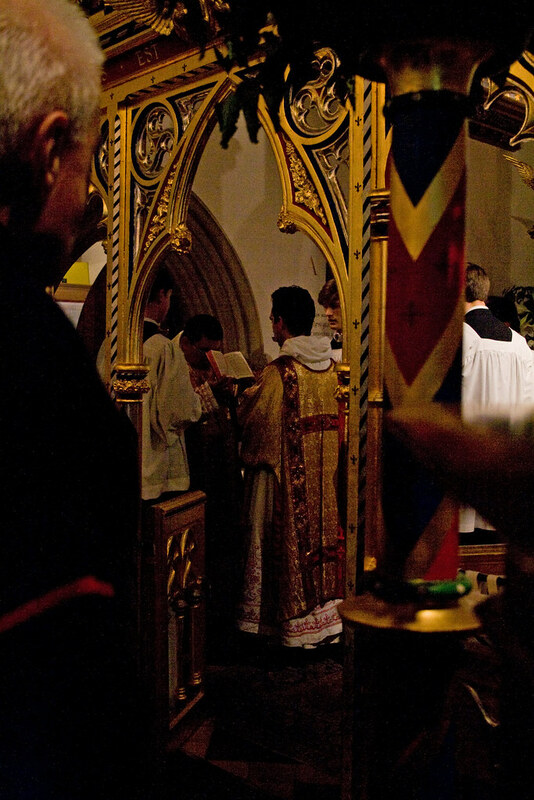 The more people encounter mystery through liturgy, the more hollow will clang the false or incomplete messages of those who have strayed from the good path, either to the left or to the right. Please note that this is not a session to learn the Extraordinary Form of the Roman rite, but a spiritual retreat. However, Fr de Malleray will readily answer any questions pertaining to the spirituality and practice of the Usus Antiquior. 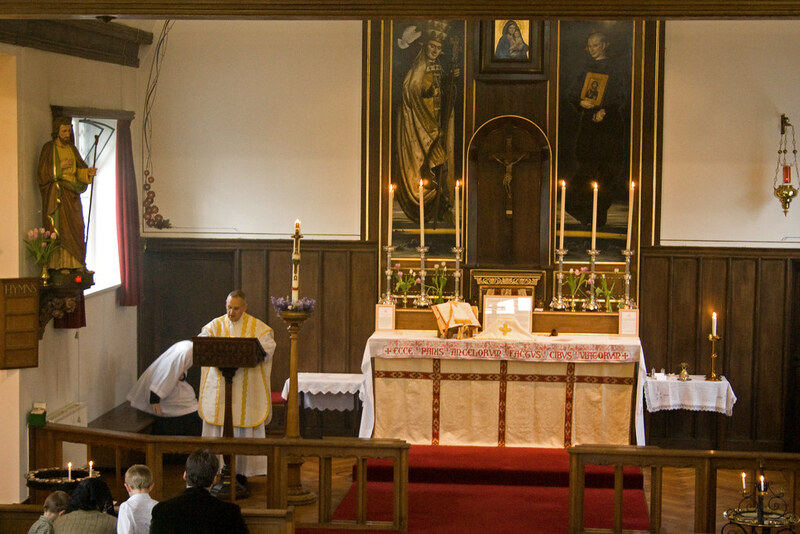 Booking: please send a £15 cheque made payable to ‘FSSP England’ to : Fr Armand de Malleray, FSSP, 179 Elgar Rd, RG2 0DH, Reading, Berkshire, UK. Location: Douai Abbey, Upper Woolhampton RG7 5TQ, Berkshire, United Kingdom (about 1 hour west from London). 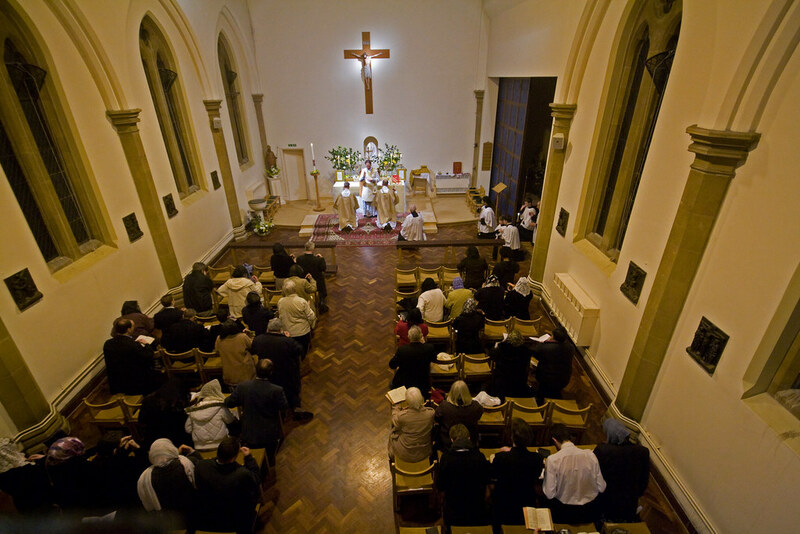 By car: Douai Abbey is situated 1 mile north of the A4 about half way between Reading and Newbury in Berkshire. The turn off the A4 is about 6 miles from M4 Junction 12. By rail: the nearest station is called MIDGHAM, but it is actually in Woolhampton village: trains from London Paddington, Reading & Newbury. A lift from and to the railway station can be arranged directly with the Guest Master (tel. : 0118 971 5399). The building is equipped for wheel chairs. N.B. Full payment will be dealt with the Guest Master at the Abbey during the retreat. Deposit has already been paid. No other payment than the £15 booking fees is required. This will be Mr Duffy's third visit, and it is not to be missed. Mr Duffy, long an associate of the late Dr Mary Berry, was Director of Music at Liverpool Metropolitan Cathedral for 30 years, He understands chant inside out and is a really inspirational teacher. These training days are enormous fun and very helpful for people at a wide range of levels of experience. See the report of last year's event. The day starts at 9.30 and ends with Mass; Mass starts at 3.30pm. Last year we had special sessions for priests which were very much appreciated; assuming there is demand, we will do this again. Fees: £20; HALF PRICE for students and FREE for clergy. All welcome - there are no restrictions on who can attend. At a lunch party with my in-laws, we were shown a relic of Cardinal Newman. God has ordained that there be very few first-class relics of the Servant of God (just some hair), but there are of course plenty of second-class ones: things he wrote or wore, for example. In English: to Henry Eubank, John Newman gives a small token of a not small friendship. Newman's scholarship and his talent for friendship are among his best known and most attractive qualities, so it is particularly pleasing to see this token which combines a reference to both, and to the fateful year, 1850, in which the Catholic hierarchy was restored. The rage of the English establishment at this act of Catholic self-assertion was the backdrop to the rest of Newman's life. 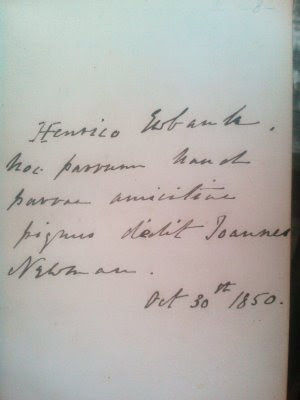 Nevertheless, he made this gift to an Anglican clergyman almost exactly a month after the date of the Pius IX's Bull Universalis Ecclesiae (29th September 1850). 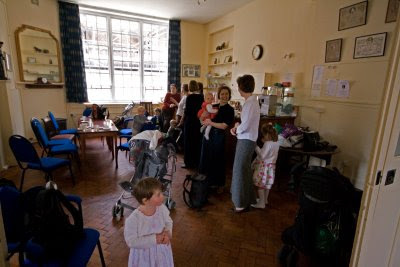 Home schooling is not big business in England, but there are quite a number of Catholic homeschoolers, nearly all of them attached to the Traditional Mass, in the Oxford area and in Reading. They have created some collaborative initiatives, including homeschooling groups in Oxford and Reading, and a home schoolers' Newsletter, edited from Reading. The other day I saw the Oxford homeschooling group in action, in the Oxford Oratory. They use the meeting rooms attached to the church, and say the rosary, and have Benediction in the Church; sometimes one of the Fathers of the Oratory gives the children catechism. The group is described in this way by Amanda Lewin, the principle organiser. Home schooling can be a daunting prospect, but it is not one that anyone need face in isolation. Although I was involved in setting these up, I'm a bit behind the curve on their actually taking place. One has already happened, another is happening this evening. Here's a picture of St Benedict surviving the attempt by his fellow monks to poison him. They had asked him to be their superior but turned out to be unreformable; he left them and set up his own monastary, at Monte Cassino. See Wikipedia. Benedictine Monks from Ampleforth talk about the way of St. Benedict. The Order of St. Benedict has had a long connection with Oxford and is currently represented through the PPH St. Benet's Hall, which was founded from the Abbey of Ampleforth. This series of talks offers an insight into the spiritual tradition of one of the mainsprings of Western Christianity. first, or join us at 8:30. I've been trying to find this for years - literally. 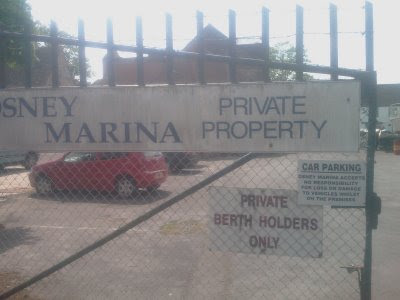 I'd heard and read that a doorway of Osney Abbey still existed, but the most promising-loooking buildings were behind the gates of the Osney Marina which always seemed to be locked. Today, by sheer chance, I was down there - at the end of Mill Street, near the Oxford Railway station - and the gates were open! So in I went, and there it was. I didn't have my real camera: I'll have to go back. 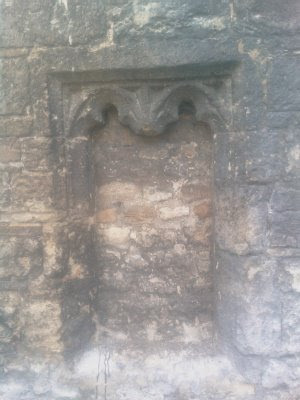 But here is the gateway, a pair of Gothic windows, and a plaque I had also read about, commemorating the execution in 1222 of Robert of Reading, aka Haggai of Oxford, who adopted Judaism in the Middle Ages. Apparently he had a Jewish girlfriend. 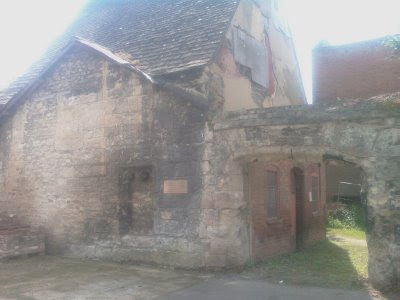 Osney Abbey was large monastery, of canons, founded in 1129 and dissolved in 1539. It was the scene of the enormously important Synod of Oxford in 1222 which applied the canons of Lateran IV to England, which included making annual confession and communion obligatory. It seems likely that Robert-Haggai was condemned at the Synod. 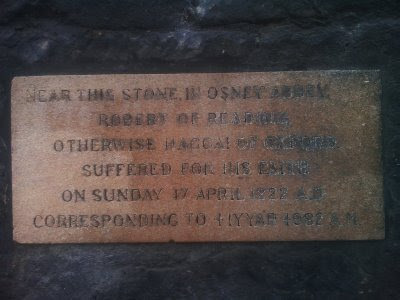 The bell of Osney Abbey, dedicated to St Thomas of Canterbury, now hangs in, and givers its name to, Tom Tower in Christchurch. There were more ruins to be seen until the arrival of the railway. Now there is just this doorway and wall. I've been collecting photographs and historical information slowly for my Catholic Oxford blog, based on an old Catholic guide book to Oxford. The First Fridays Masses were an initiative of Fr John Saward when he took over at SS Gregory & Augustine. 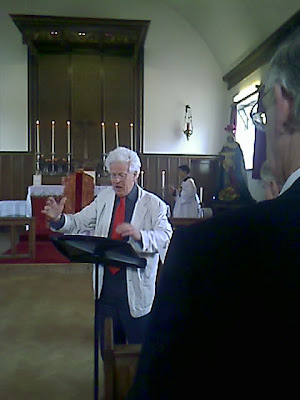 They have been invaluable in providing an opportunity for a schola to sing and servers to serve missa cantata, although they don't attract especially large congregations. Perhaps people should reflect more on the promises Our Lord made to those who take part in this devotion to the Sacred Heart. 11. Persons who propagate this devotion shall have their names eternally written in my Heart. 12. 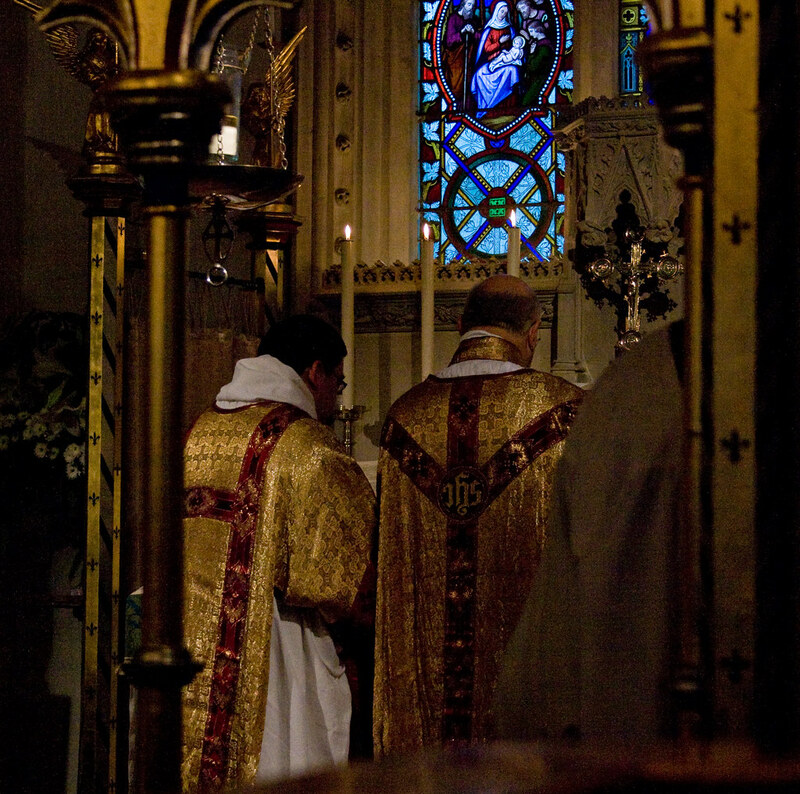 In the excess of the mercy of my Heart, I promise you that my all powerful love will grant to all those who will receive Communion on the First Fridays, for nine consecutive months, the grace of final repentance: they will not die in my displeasure, nor without receiving the sacraments; and my Heart will be their secure refuge in that last hour. Here is Fr Saward's sermon, for those who missed it. I have created an account with Gloria TV. My home page is here. The cantor pitched the Offertory a little high, but the hymn Caelitum Joseph is lovely. I've also created an 'album' of videos of interest to LMS supporters and friends, and an LMS 'parish', which other people can join. How useful these things will be time will tell. Gloria TV seems to be a little coy about explaining how it works, but it has a lot of good features. And who wouldn't rather use a video site with the motto 'The more Catholic the better', rather than YouTube, which shows videos of people desecrating the Blessed Sacrament but pulls down videos critical of Planned Parenthood? 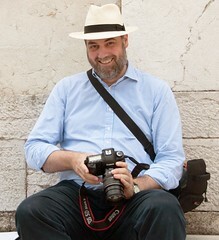 I have also recently gone onto Flickr: here's my home page. Most useful on Flickr is the page showing 'sets' of photographs. I've also established a Latin Mass Society 'group'; others can join this and add relevant pictures, which can also be moderated. At the time of writing, only a few weeks after I started it, there are 420 photographs in this group; it is clearly far faster and simpler than a photo gallery on a conventional website, though it doesn't necessarily replace it. You can embed Flickr photos in blog posts very easily; you can either upload its url or use the 'embed' code they give (look at the picture in 'all sizes'). If you do the latter you may need to make it smaller; in Firefox this can be done by dragging. Keeping up with the technology is hard work: you have to run to stay still! But it is not optional. 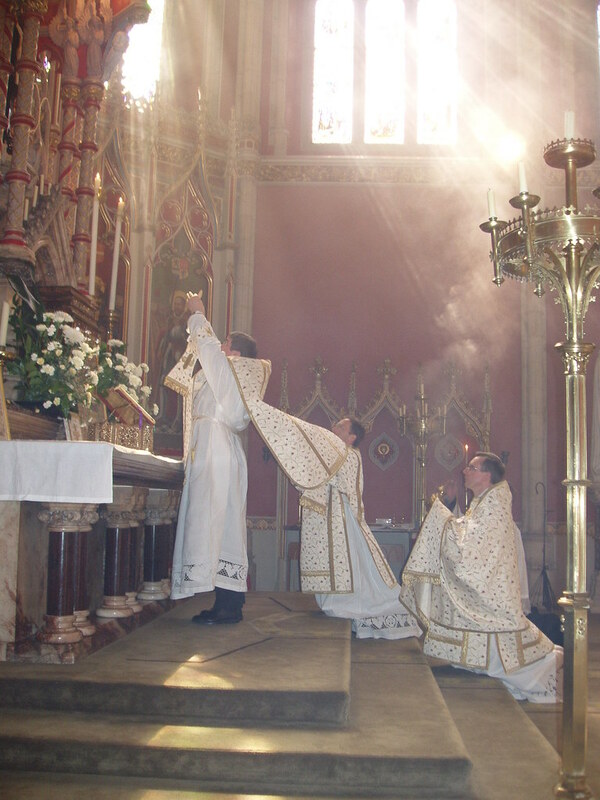 Photos and videos are absolutely essential to promoting the traditional Mass in the modern world. Please join these groups and contribute your content! On Thursday I travelled to Cardiff to give a talk to the University Pro-Life Society there, on euthanasia. I see the advert for my talk is still on their website, in Welsh as well as English. (They also have a Facebook group.) I'm happy to say I wasn't required to speak or answer questions in Welsh, which would have stretched me a bit. I was put in touch with the Pro-Life Society by the local Latin Mass Society Representative, who is also the LMS's Deputy Chairman, Kingsly Lewis. I was able to spend some time with Kingsly before the dinner, and we visited the Cathedral, among other places. It was completely destroyed in the Second World War, and hasn't had a very good time since the Second Vatican Council either. It is just the sort of church where some energetic traditionally-minded restoration could do wonders. The high altar has been replaced with the inevitable chair. Some of the surviving side altars are quite handsome. The tabernacle is in a movable, freestanding wooden box. On Wednesday we had the first meeting of term of the Schola Abelis; on Friday we had our first Sung Mass, since it was the First Friday, which is usually sung in term time at SS Gregory & Augustine. Despite the small preparation time, the Mass went extremely well. The good turn-out we had at our practice augers well for the term. Last Sunday, the Second Sunday after Easter, I sang at the fortnightly Sung Mass in Reading, which has become an established feature of St William of York, alternating with Low Mass. 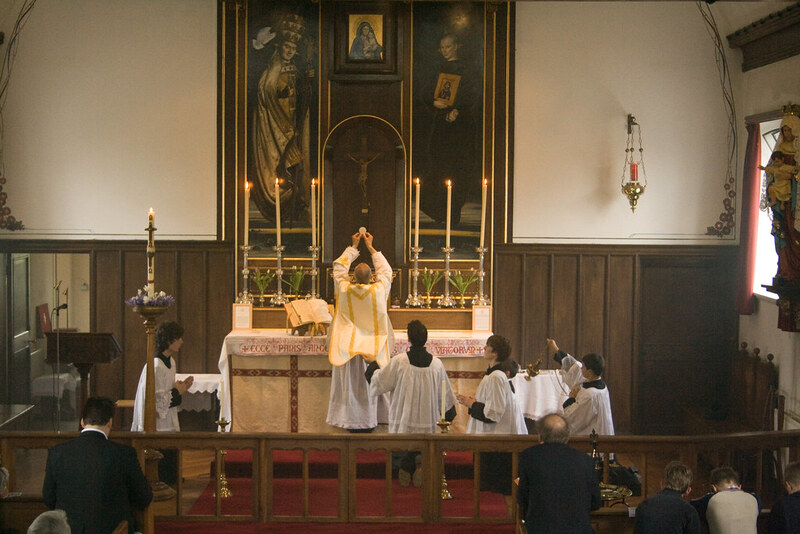 There are some more pictures of that Mass here. At 5pm, however, I sang the same Mass again in SS Gregory & Augustine, with the assistance of Mr Adrian Taylor, and some members of the Schola Abelis (it was technically the first day of term, so many of the students weren't around). 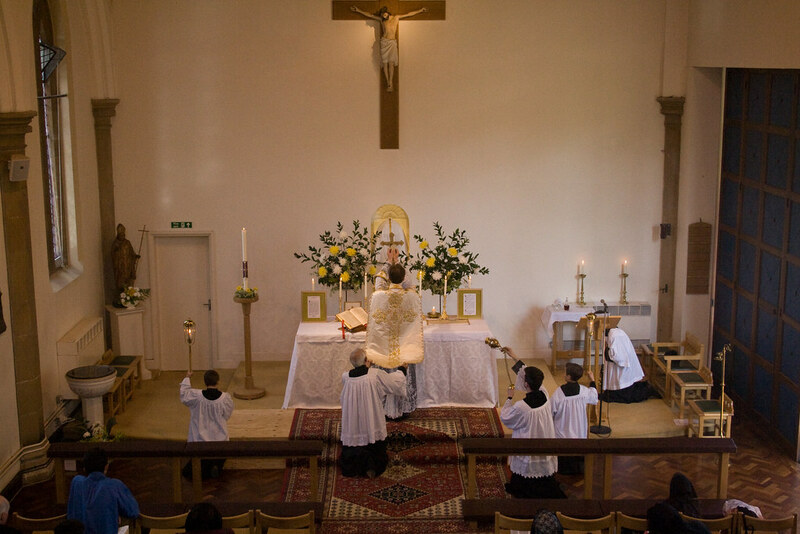 This Mass is a first, which I hope will be repeated; there have in fact been no Traditional Sung Masses on Sundays since the end of the FSSP Mass Centre in 2005. 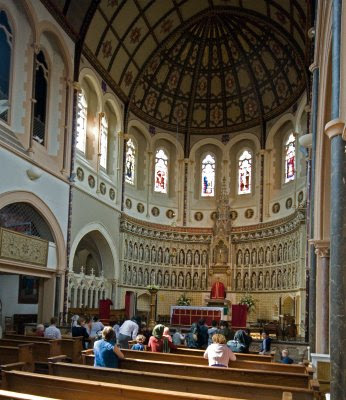 The regular Sunday Mass at the Oxford Oratory, at 8am, is always Low. So it was a particular joy to hear the Vidi Aquam and the prayer for the Queen, Domine Salvum Fac, which are only sung on Sundays, in Oxford once more! 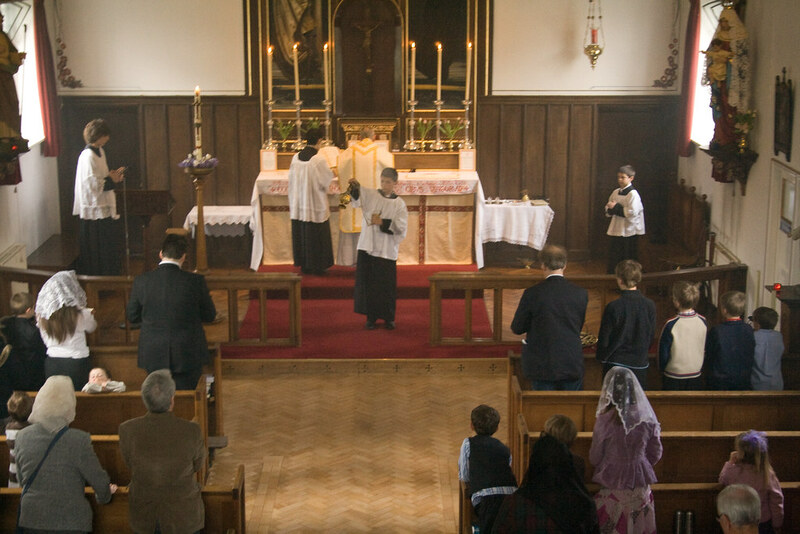 The occasion for this Mass was the reception of an adult convert. Not to embarass him too much it was a wonderful occasion to welcome him into the Church; his wife has been very active in traddie circles and his sons serve the Mass. Here is a picture of him being incensed (with the rest of the congregation) by his son. Lucy Shaw Cakes provided an appropriately decorated cake. The books include many of those which led him into the Church. As C.S. Lewis said, reflecting on his own experience, an agnostic must be very careful what he reads! 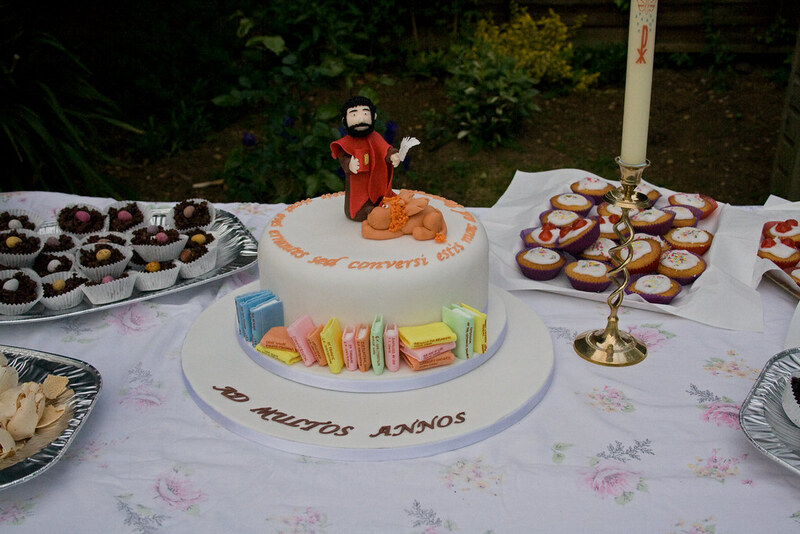 There are more photos of this Mass here, and more about the cake from Lucy Shaw Cakes. 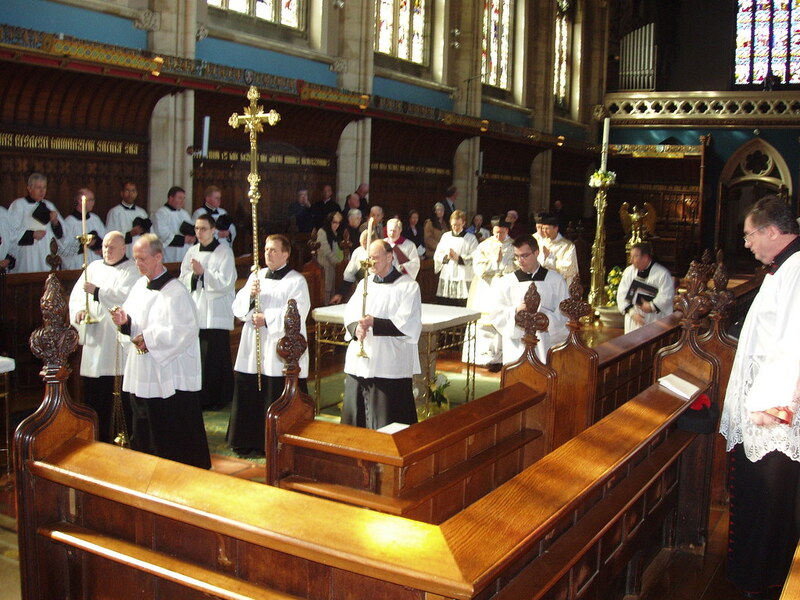 Yet more photographs of the Ushaw Priests Training Conference. These ones were tacken by Leo Darroch, President of Una Voce International, Vice President of the Latin Mass Society, who lives in County Durham. Thank you very much, Leo!